Greater Georgetown, Guyana – We, the Heads of State and Government of the Caribbean Community and the Republic of Cuba, meeting in St. Mary’s, Antigua and Barbuda, on 8 December 2017, on the occasion of the Sixth CARICOM-Cuba Summit and in commemoration of the forty-fifth anniversary of establishing diplomatic relations among the independent states of CARICOM and Cuba and the fifteenth anniversary of CARICOM-Cuba Day. Reiterate that the unity and integration of our Caribbean region is based on respect for the Purposes and Principles enshrined in the Charter of the United Nations and in international law. Therefore, we commit our wholehearted support to sovereignty and territorial integrity, self-determination, non-interference in the internal affairs of each country and the protection and promotion of human rights for all. Reaffirm the Proclamation of Latin America and the Caribbean as a Zone of Peace, signed in Havana in January 2014, which recognizes, among others, the inalienable right of every State to choose its political, economic, social and cultural system. Welcome the outcomes of the regular meetings of Ministers of Foreign Affairs of CARICOM and the Republic of Cuba, which continue to serve as a platform for political engagement. These meetings reinforce the commitment of our political leaders to strengthening the bonds among our countries. In this regard, we acknowledge the outcome of the Fifth Meeting of Ministers of Foreign Affairs of CARICOM and Cuba held in Havana, Cuba, on 11 March 2017, which identified disaster risk reduction, trade and investment, education and health for deeper cooperation. Reaffirm our will to strengthen South-South cooperation as an expression of solidarity among our countries, for the promotion of bilateral and regional programmes as well as triangular cooperation for development, taking into account the development priorities of our countries. Recognize the cooperation between the countries of the Caribbean Community and Cuba in areas such as health, training of human resources, construction, sports, and disaster risk reduction and mitigation has effectively contributed to the development and wellbeing of our peoples. In this regard, we reaffirm our commitment to continue promoting the implementation of projects to improve air and sea infrastructure and connectivity between our countries, strengthen our capacity to reduce disaster risk, promote regional energy integration and broaden our economic and trade relations through the implementation of the revised Trade and Economic Cooperation Agreement between CARICOM and Cuba. Reject the imposition of unilateral coercive measures and, in that context, call for an immediate end to the economic, commercial and financial embargo imposed by the government of the United States of America against Cuba and, especially, to its extraterritorial nature and the financial persecution of Cuban transactions, whose severity has increased. In this regard, we reiterate our firm rejection of the application of laws and measures contrary to International Law, such as the Helms-Burton Act, including its extraterritorial effects. Furthermore, we call for an immediate end to all actions that the U.S. government is carrying out to subvert domestic law and order in the Republic of Cuba, including those that involve the illegal use of information and communications technologies that constitute violations of Cuban sovereignty and its people’s right to self-determination. Note the designation of 2017 as the International Year of Sustainable Tourism for Development and the opportunity this presents to create a more responsible tourism sector capable of harnessing its immense potential in terms of economic prosperity, social inclusion, and environmental preservation. In this regard, welcome the outcomes of the Conference on Jobs and Inclusive Growth: Partnerships for Sustainable Tourism held in Montego Bay, Jamaica on 27 to 29 November 2017, during which the Caribbean showcased its diverse tourism product to the world. Recognize the promotion of sustainable tourism as one of the keys to economic growth in the Caribbean region, as identified in the Strategic Plan for the Caribbean Community 2015-2019, and agree to strengthen cooperation in this area, including multi-destination tourism. In this regard, welcome the signing of the Memorandum of Understanding by the government of Cuba and CARICOM states on Multi-Destination Tourism. Develop cooperation in information and communications technologies (ICT) in full compliance with the principles of international law, in order to enhance their contribution to the sustainable development of the member countries of CARICOM and Cuba, particularly in the spheres of education, health, science and technology, innovation, agriculture and all those sectors that are required. Welcome the proposed Memorandum of Understanding on Science, Technology and Innovation which will enable joint cooperation, including the development of enhanced research and development capacity for the participants. Welcome the signing of the Second Protocol to the Trade and Economic Cooperation Agreement between CARICOM and Cuba, aimed at increasing bilateral trade flows and improving the implementation of the Agreement; and encourage our officials to continue to work in the spirit of solidarity and goodwill that has characterized their efforts to date, to develop a work programme for advancing implementation of mutually agreed priority areas of the Agreement. Recognize the importance to the Caribbean countries of taking advantage of the potential offered by the regional and sub-regional mechanisms such as CELAC, ACS, ALBA-TCP, PETROCARIBE as well as international mechanisms such as BRICS. Emphasize our commitment to combat trafficking in persons, illicit drugs trafficking and illicit trafficking of small arms, bearing in mind the characteristics, scope and magnitude of these problems in each individual state. In that regard, continue to promote joint actions and exchanges of experiences and information on security, as well as prevention and countering of transnational organized crime and other new threats related to cybersecurity, among other areas. Continue strengthening cooperation for the protection of the environment and the sustainable use of our resources, in particular those in the Caribbean Sea. In this regard, we support the designation of the Caribbean Sea as a “Special Area in the Context of Sustainable Development” by the UN; support the mandate of the Caribbean Sea Commission, recognized at the Fourth Summit of CELAC, to promote its preservation and sustainable use. In that regard, we express our firm rejection of the continued use of the Caribbean Sea for the transit and transshipment of nuclear material and toxic waste and urge the countries that produce and transport them to urgently implement the pertinent measures to put an end to such activities. Welcome the signing of the Memorandum of Understanding in Disaster Risk Reduction between the Caribbean Disaster Emergency Management Agency of the Caribbean Community and the National Civil Defense General Staff of the Republic of Cuba. Reaffirm that the preservation and consolidation of CELAC as a forum for dialogue and international political actor is one our priorities. In that context, we consider it to be fundamental to continue strengthening regional integration through political dialogue, cooperation and increased trade among the countries of the Caribbean and Latin America. In that regard, we reaffirm the importance of Caribbean countries’ active participation within CELAC and we recognize the role played by successive Chairs of Conference of CARICOM within the CELAC Quartet, representing the interests of its members. Continue to advance cooperation in the area of food security in pursuance of Objective 2 of the 2030 Agenda for Sustainable Development to “end hunger, achieve food security and improved nutrition, and promote sustainable agriculture”. In this regard, we commit to coordinate our efforts and the exchanges on agricultural technology, nutrition and other sectors that contribute to this end, including the actions for the implementation of the Plan for Food Security, Nutrition and Hunger Eradication of CELAC 2025. Reaffirm that even though middle-income countries in the Caribbean region have achieved significant advances in fulfilling the Millennium Development Goals, we still face enormous challenges in our path to development, including those derived from the nature of being small islands and vulnerable countries, and those related to climate change. In this context, we reiterate our call to review and modify the current "graduation" criteria of the countries to receive Official Development Assistance, so that they adequately reflect the reality and specific needs of the Highly Indebted Middle-Income Countries (HIMICs), in particular of the Caribbean, and integrate the different dimensions of sustainable development included in the 2030 Agenda, considering that the current criteria referring to average incomes, especially the criteria of per capita income indicators, do not reflect the multidimensional effects of poverty, inequality and vulnerability. Express deep concern about the progressive decline in correspondent banking relations being experienced by a significant number of developing countries, particularly CARICOM Member States, due to de-risking actions by some of the major international banking corporations, which threatens the financial stability of the affected countries and limits their efforts to achieve development and socio-economic growth. Express deep concern about the inclusion of CARICOM Member States in the lists of non-cooperative tax jurisdictions generated by many partner states in the hemisphere and beyond, including in the EU list of non-cooperative jurisdictions for tax purposes published on December 5, 2017 by the Council of the European Union, and call for a change to this approach which serves to negatively impact the economies of small vulnerable states that have implemented recognized international standards and have demonstrated a commitment to engage in cooperation and dialogue to find solutions that are mutually beneficial. Reaffirm the commitment of the CARICOM countries and Cuba to implement the new global development agenda, consisting of the 2030 Agenda for Sustainable Development, and its 17 Sustainable Development Goals, the Addis Ababa Action Agenda on Financing for Development, the Sendai Framework on Disaster Risk Reduction, the Paris Agreement on Climate Change and the New Urban Agenda of Habit III. Reaffirm the commitments undertaken at the Third International Conference on Small Island Developing States that took place in Apia, Samoa, 1-4 September 2014, as well as the commitments outlined in the S.A.M.O.A Pathway. Welcome the adoption and efforts for the implementation of the United Nations 2030 Agenda for Sustainable Development, which has a universal character and integrates the three pillars of sustainable development: economic, social and environmental. The full implementation of the Agenda requires the creation of capacities and the establishment of an international mechanism that facilitates the transfer of environmentally friendly technologies, under favorable conditions, for developing countries, as well as the reform of multilateral trade rules. The industrialized countries have a moral duty, financial and technological resources and a historic responsibility to increase investment and cooperation with developing countries, particularly the Caribbean, and to contribute decisively to the creation of a suitable international environment for sustainable development. Support the implementation of Sendai Framework for Disasters Risk Reduction 2015-2030 by Caribbean countries and affirm our readiness to work together on a Regional Strategic Agenda to address Disaster Risk Management in a comprehensive manner, taking into account disaster risk estimates and reduction, humanitarian assistance and reconstruction, in accordance with United Nations General Assembly Resolution 46/182, in order to address the serious consequences of disasters and climate change in our countries. Reiterate our resolute solidarity with the Small Island Developing States and territories of the Caribbean that suffered the devastating passage of two hurricanes of great intensity in a period of less than 12 days in September 2017. We note with satisfaction the successful outcome of the international Donor Conference convened by CARICOM and the United Nations Development Programme, in New York, on 21 November 2017, recognizing that the pledges made at that meeting when realised will positively impact those countries most affected by Hurricanes Irma and Maria. In that regard, we reaffirm our strong commitment to support recovery and reconstruction efforts with the aim of making the Caribbean a climate resilient region. Welcome the adoption of the Paris Agreement at the 21st Conference of the Parties to the United Nations Framework Convention on Climate Change and call for its full implementation, based on the principle of common but differentiated responsibilities. Decide to strengthen our cooperation to address the negatives effects of climate change. In this regard, we reiterate our commitment to achieving the goal of the Paris Agreement to stabilize the rise of world temperatures below 2°C, and pursue efforts to limit temperature increase to 1.5°C taking into account the principle of common but differentiated responsibilities and to address the needs of our countries to the challenges of adapting to impacts of climate change, in accordance with the Framework Convention and the decisions of the Conferences of the Parties. Welcome the successful outcome of the Conference of the Parties (COP23) of the United Nations Framework Convention on Climate Change in Bonn, on 6-17 November 2017, and call on the international community to take into consideration the special circumstances of SIDS and the crucial need for the effective implementation of the 2030 Agenda for Sustainable Development. Support the Growth and Development Agenda of CARICOM and Cuba towards creating an enabling environment that facilitates building of climate resilience, innovation and as a means of unlocking the potential of our nations. Note with deep concern the impact of Non Communicable Diseases on our societies and commit to partnering in the fight against the epidemic of NCDs. In this regard, recall that the year 2017 is the Tenth Anniversary of the seminal CARICOM Heads of Government NCD and Declaration “Uniting to Stop the Epidemic of Chronic Non-Communicable Diseases (NCDs)”. In this regard, recognised the primary role and responsibility of Governments in responding to the challenge of NCDs and the essential need for the efforts and engagements of all sectors of society to generate effective responses through multi-sectoral action for the prevention and control of NCDs. We reaffirm our commitment to achieving the nine global NCD targets, taking into account national circumstances. Reiterate our commitment to support efforts in preventing the entry and spread of HIV-AIDS and other diseases such as Dengue, Zika and Chikungunya in our countries, as well as efforts to facilitate the treatment of non-communicable diseases. We also support projects aimed at assisting differently-abled persons in the region. In this regard, we recognize the active role of Cuba and the valuable support being given to the region for the creation in Guyana of a Regional Centre for the Stimulation of the Development in Chrildren, Adolenscents and Young People with Special Educational Needs Associated with Disabilities. Emphasize the importance of culture as a significant instrument to achieve sustainable development, unity, peace, education and common understandings among our peoples. Note the importance placed by the Caribbean Community on the issue of reparation for native genocide and Caribbean slavery and their desire to engage with the European countries intimately involved in native genocide, slave trade and slave-owning in a reparatory dialogue to address the sequel of this crime against humanity. Express our gratitude to the Government and People of Antigua and Barbuda for the warm welcome and hospitality afforded to us during the Sixth Summit of Heads of State and Government of the Caribbean Community and the Republic of Cuba. 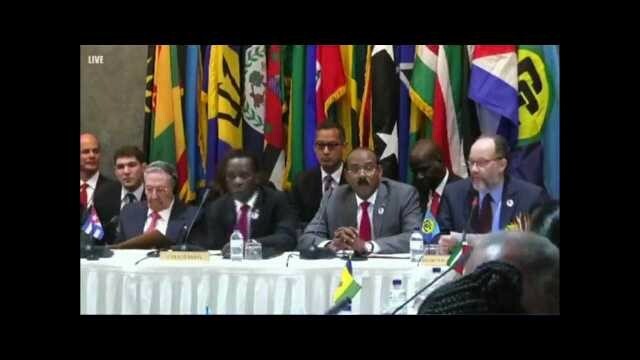 Decide to convene the Seventh CARICOM-Cuba Summit on 8 December 2020, in Cuba and the Sixth Ministerial Meeting in a CARICOM country, in the month of June 2019. Adopted in St. Mary’s, Antigua and Barbuda, on the 8th day of the month of December 2017.